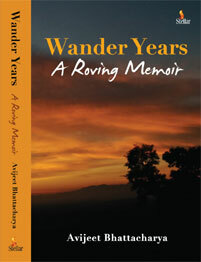 Wander Years is an adventurous amalgamation of a travel chronicle and roving memoir. It feasts your appetite for journeys within India and to foreign shores with exploratory tales of exciting discoveries where, leaving aside life’s treadmill, you traverse destinations as varied and diverse as the lavish temples and grand palaces of South India, the forts of Rajputana, the staggering ranges of the snow-covered Himalayas in Sikkim, and the sweeping tea gardens of Darjeeling; the fullness of forests with arcane tribes in Andaman and Nicobar Islands; the mangrove deltas of Bengal and the Saranda forests of Orissa. of sand dunes, the Sultanate of Oman with the souks of Muscat, the tents of the Bedouins, the vast African grasslands with Masai huts and backdrop of roaming wild herds of the East African savannah, the lion’s hunt; the moon shining silvery on dark waters, the indigo blue of infinite oceans with stunningly colourful coral reefs, dolphins crossing the bows of your ship as the vessel cuts through liquid phosphorescence; the grand Kingdom of Thailand with ancient Siam and mystical Marine Caves... A bewildering kaleidoscope of people and places with their lore and history! Avijeet Bhattacharya is a travel enthusiast, and a history and geography rooter, who in his travels turned into an adventurer and chronicler of a rare kind. As he journeyed, he explored the improbable and went about writing his travel tales. Work, postings, assignments, interests and pleasure that were always well-received by his family, took him to places where he lived, toured and travelled. What he and his family saw and discovered was commoving, with places, people or incidents lending deep insight into histories, lore, and vibrant stories of real life. An alumnus of Modern School and St. Stephen’s College, Delhi, he has held responsible administrative and managerial positions, having been intimately involved with transport, sea and shipping until he settled down to write this absorbing memoir. He was married to Sharda, his wife of many memorable years, and now lives with his daughter Priyadarshini, in New Delhi, where his pen and keyboard wait to churn out more tales of considerable fun, questful exploits, and wanderings.